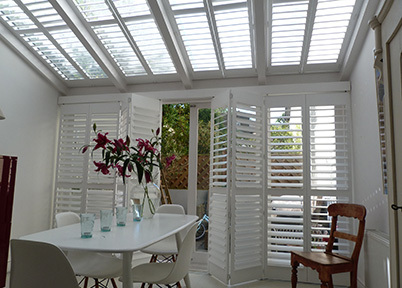 The Bespoke Shutter Company supply and install a full range of conservatory shutters which will add that finishing touch to your home. Whatever the shape of your conservatory and the size of the glass panels within it, The Bespoke Shutter Company has your ideal conservatory shutter solution. 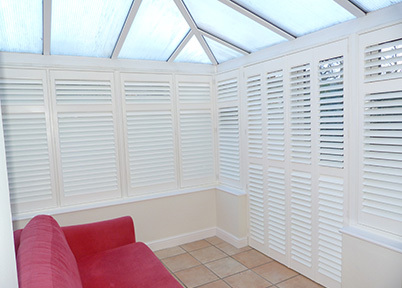 Plantation shutters are used in the conservatory for their great looks and functionality. 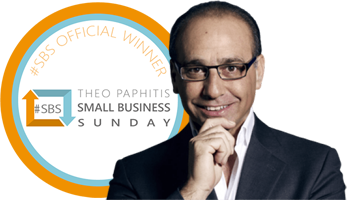 Fitting plantation shutters to the glass panels is the very best way of reducing the glare of the sun, whilst allowing the maximum amount of daylight into the room. Conservatory plantation shutters can be fitted to match exactly with the shapes, sizes and angles of the sheet glass panels that make up the doors, windows and ceiling of you conservatory. In this way, they can very effectively guard against blinding sunlight, from whichever angle it comes. When in the open position, the louvered slats allow in plenty of natural light. Their clean, straight lines echo the shape of your conservatory and since each lightweight but hardwearing slat is supported at either side, it will not sag in the middle and will remain very neat and precisely aligned.